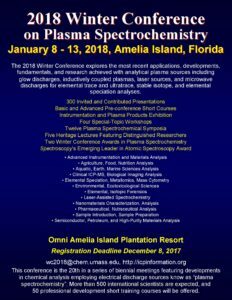 Will you be attending the 2018 Winter Conference on Plasma Spectrochemistry? 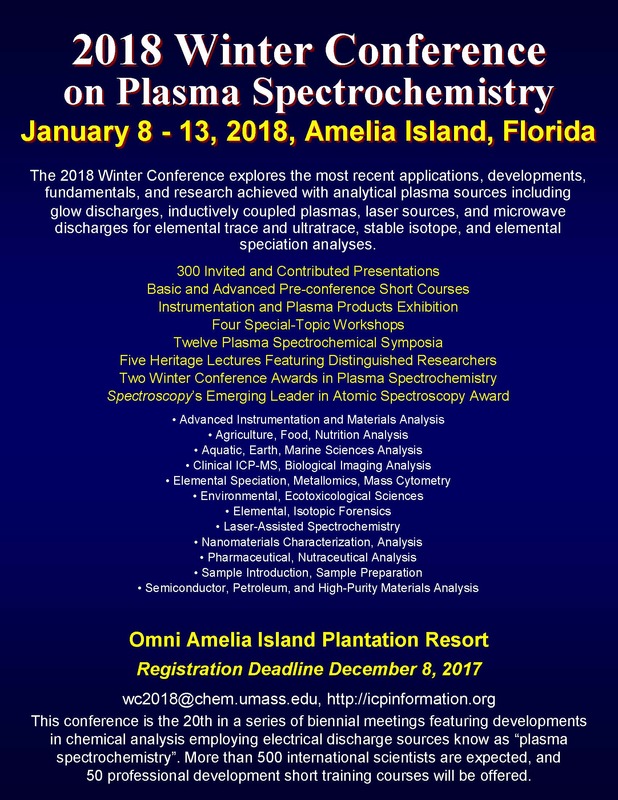 The biennial Winter Conference on Plasma Spectrochemistry is sponsored by the ICP Information Newsletter, Inc., a non-profit research organisation located in Hadley, Massachusetts and Lehigh Acres, Florida, and organised by Dr Ramon Barnes of the University Research Institute for Analytical Chemistry. 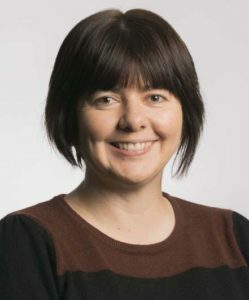 The 2018 Winter Conference explores the most recent applications, developments, fundamentals, and research achieved with analytical plasma sources including glow discharges, inductively coupled plasmas, laser sources, and microwave discharges for elemental trace and ultra-trace, stable isotope, and elemental speciation analyses. This conference is the 20th in a series of biennial meetings featuring developments in chemical analysis employing electrical discharge sources known as “plasma spectrochemistry”. More than 500 international scientists are expected to attend with 300 invited and contributed presentations and 50 professional development short training courses being offered. The meeting will take place at the Omni Amelia Island Plantation Resort on Amelia Island, Florida. The pre-registration deadline is October 13, 2017. The registration deadline is December 8, 2017. More information can be found online. 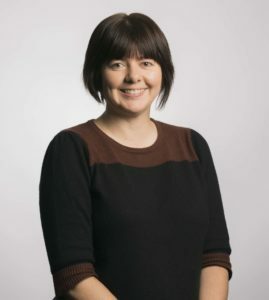 Philippa Hughes, Executive Editor of JAAS will be in attendance and JAAS will also be sponsoring two poster prizes this year – good luck to all of the entrants! 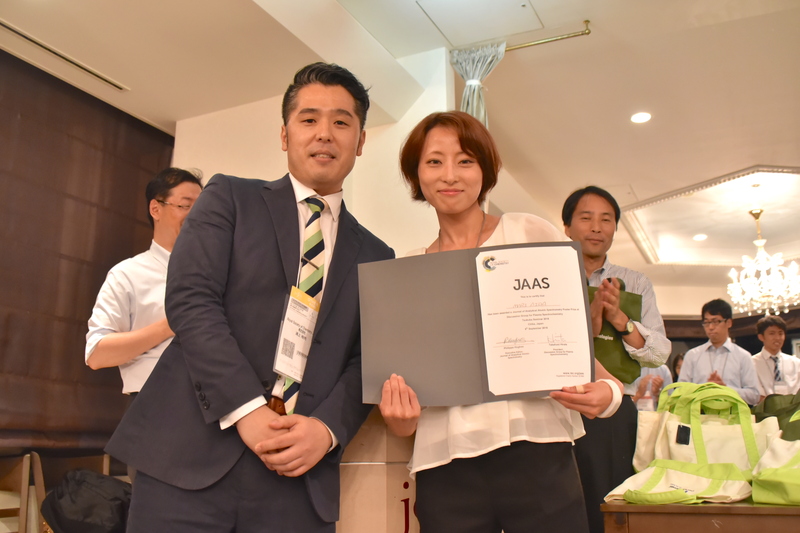 Our JAAS board members have certainly been busy this month. Many of them attended the 14th Rio Symposium on Atomic Spectrometry meeting, in Vitória City, Brazil, 2nd – 7th April. 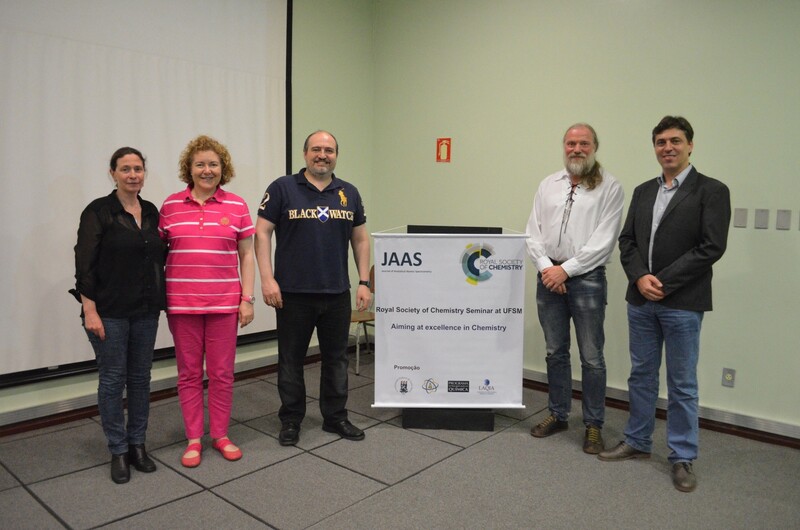 They barely had time to catch their breath before attending the Royal Society of Chemistry Seminar at UFSM, 10th April, at the Federal University of Santa Maria, Brazil. 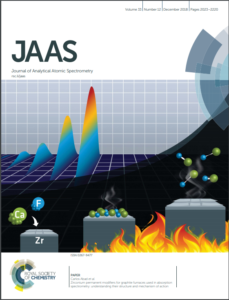 This was organised by JAAS Editorial Board member Erico Flores (UFSM). It was attended by JAAS Editorial Board member Jörg Feldmann (University of Aberdeen) and JAAS Editorial Board Chair Martin Resano (University of Zaragoza). Lectures and talks were given by Erico, Jörg and Martin, along with Eva Krupp (University of Aberdeen). The meeting was a complete success, with registration demand exceeding the number of available spaces. Meeting participants were a mixture of researchers from various scientific fields. Audience engagement was exceptional and the questions and answers at the end had to go on for an extra hour! The quality of the seminar’s content was top notch, which is no surprise, considering the line-up of speakers. Participants now have no excuse about not knowing how to submit to JAAS after Martin Resano’s talk: “How to publish in RSC journals”. Other topics included “From rice to whales – a journey into mercury speciation”. All of the talks and lectures were met with great enthusiasm. 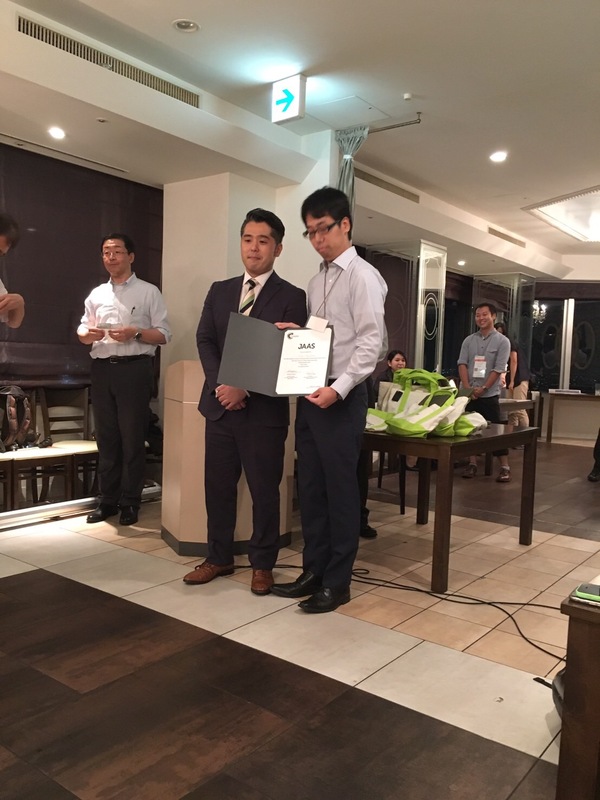 Congratulations to Erico, for the success of the seminar, and a huge thank you to all participants and speakers. 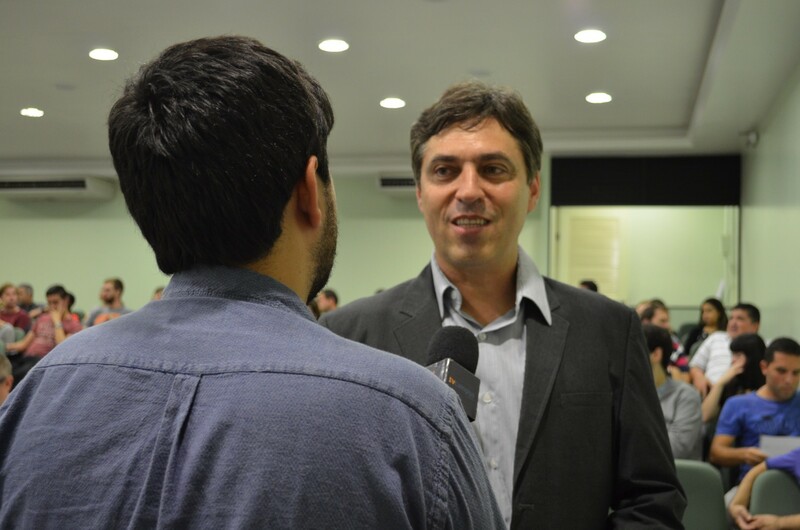 Due to the success of the meeting, JAAS will very certainly look into holding future events in Brazil. CSI XL 2017 will be held from 11th – 16th June, 2017, in Pisa, Italy. The 40th Edition of CSI “represents a historic forum among scientists presenting and discussing recent developments in fundamentals and applications in all branches of Spectroscopy”. The conference’s programme includes a mixture of oral presentations, poster presentations, plenary, invited and keynote lectures. Topics covered will be wide ranging, from nuclear techniques to food analysis. 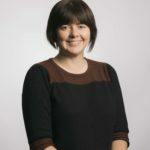 JAAS Deputy Editor Rebecca Brodie will be attending CSI XL. Come and say hello to Rebecca and have a chat about JAAS, the Royal Society of Chemistry and publishing in general. Please feel free to get in touch before the conference to arrange a meeting. Will you be at EWCPS 2017? Will you be at EWCPS 2017 on 19th – 24th February in Sankt Anton Am Arlberg, Austria? 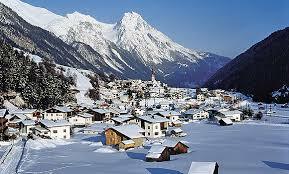 The European Winter Conference on Plasma Spectrochemistry (EWCPS) will be held in Sankt Anton, Austria, this February. If you are attending the meeting, why not find me and have a chat about JAAS, the important work of the Royal Society of Chemistry, and publishing in general. Allow me to explain why our journal is the best home for your research. Please feel free to get in touch with me before the conference to arrange a meeting. I look forward to meeting you in Sankt Anton!